Family praise and worship time is important to us at our house. And as the kids get older, I can’t wait to add in more Bible studies to our family devotion time. I was so excited to review Draw to Learn from Notgrass Company with Curly. We had such fun working our way through the book of Proverbs together! Art and Scripture combined – that’s a perfect combination for our art-loving family! 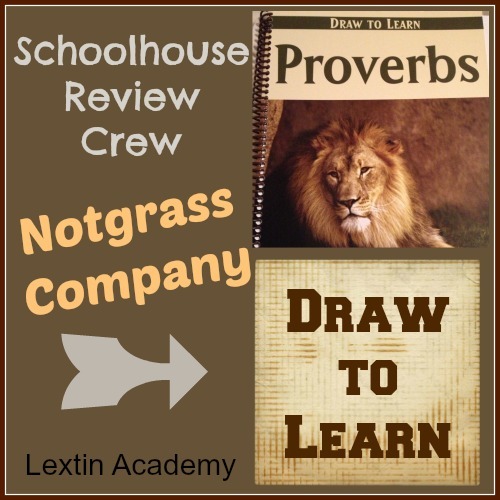 Notgrass Company is a family-owned company that publishes Bible-based homeschool curriculum. Their aim is to provide encouragement as well as equip homeschooling parents to reach both the heart and mind of their students. Notgrass offers curriculum and unit studies for all ages from early elementary to highschool level. Draw to Learn is a Bible study curriculum guide with an emphasis on art. The purpose of this series is to help children understand truths in the Bible through reading the Scripture, thinking on the Scripture, and then drawing a picture to represent their understanding. Each book in the series has 150 lessons that contain a Scripture reference at the top, a large blank area for the drawing in the middle, and a short explanation, thoughts for discussion, or drawing instruction at the bottom of the page. There is also a brief summary of the main idea of each passage that is written above the drawing space. The books are designed to be used with a child of any age as they can participate in the discussion at their own level and create drawings at their skill level. The Draw to Learn series is for any age and the books retail for $14.95 each. You can also purchase a digital version of each book for $9.95. After looking through the various books in the series, we focused our time on the book of Proverbs as I felt Curly would best understand the Scriptures and truths from this book. After we read the Scripture, I read the words from the bottom of the page. These were usually some topics for further discussion as well as drawing prompts. Curly would then work to complete her drawings while we had our discussion. We first read Proverbs 4:7-9. These verses exhort you to cherish and embrace wisdom for she will be a garland to grace your head and a glorious crown. As Curly drew her picture I asked her if she would like a crown and what it meant to be someone who wears a crown. Then we talked about why wisdom would be compared to having a crown. The drawing instructions and the discussion ideas are very open-ended and have very little detail. While this allows you to guide the discussion fully, some people might benefit from more detailed explanations and instruction. It would be helpful to work through these books with a good study Bible on hand. The books take you directly to Scripture and encourage you to read the truths for yourself. I like that we were able to get into the Bible together and work our way through one of the books. No children’s Bible or overly-simplified readings here. I think the aspect of drawing a picture of the Scripture is an excellent tool for seeing how well the child understood the topic. As Curly drew her pictures we were able to discuss the details of each picture and I could help her better understand the Scriptures. These are excellent Bible study resources for a family who enjoys art and drawing. Being able to create a picture journal of Scripture can be very motivating for kids who enjoy expressing themselves creatively. I felt that this series was an excellent stepping stone for us as we begin to read straight from the Scriptures with our kids. Curly was able to draw and keep her hands busy while we discussed the Scripture. And once she finishes the book, she will have her own illustrated version of the book of Proverbs. What a great keepsake! See other reviews of great Notgrass Products from the Review Crew here!